Have you heard of the anti-ageing therapy or rejuvenation therapy in Ayurveda, referred to as ‘Kaya Kalpa Chikitsa’ or ‘Kaya Kalpa Therapy’? It is an ancient rejuvenation practice, wherein, the Sanskrit word Kaya Kalpa literally translates into ‘Kaya’ referred to as body and ‘Kalpa’ refers to transformation. It is the art of living healthy, living longer, maintaining youthfulness of body and mind, and ageing graciously. Kaya Kalpa was propagated by several saints in ancient days. It is a simple technique that helps increase the vitality of our body, and helps us lead a healthier and longer life. According to Vedic texts, Kaya Kalpa is a set of specific therapies that can actually reverse the physical degeneration caused by age. The treatments are thought to bring life to old cells. Basically, Kaya Kalpa detoxifies all impurities in the body and then replaces it with nourishing ‘rasayana’ foods. In order to notice a difference the formation of new cells should be quicker than the degeneration of old cells. Kaya Kalpa helps in preserving healthy, youthful tissues, by suspending the ravages of time. Why is Kaya Kalpa Therapy essential? When the body is not in sync, it can lead to disease, distress and discomfort. Kaya Kalpa Therapy helps in curing degenerative diseases, improves longevity by bringing in harmony of the body, mind and psyche through purification, nourishment and rejuvenation. With changing lifestyles such as being sedentary, lack of intake of food on time, pollution, and other environmental conditions, several youngsters are falling victim to health problems like hypertension, diabetes, osteoporosis, arthritis, psychosomatic problems, spondylitis, stress, and strain. Kaya Kalpa Therapy is recommended to people with busy lifestyle, office goers, elderly, tired housewives and generally to anybody who are stressed out. Massage of whole body with specific herbal oils, aimed at nourishing and revitalizing the body tissues and to help eliminate toxins from the body is called ‘Abhyanga’. This massage is much deeper and offers far-reaching effects than an ordinary massage using mineral oils and lotions. Abhyangam is performed symmetrically by two therapists for an hour and is followed by Steam bath (Swedam). This is among the most rejuvenating treatments of Ayurveda. It helps increase tissue strength, rejuvenates the whole body, improves blood circulation, delays aging, beautifies the skin, promotes sound sleep, promotes vitality, pacifies vata imbalance and reduces stress and removes toxins. This involves pouring of medicated oil and herbal decoctions on the forehead for 30 to 45 minutes in an oscillating manner. For instance, a stream of medicated warm oil, herbal decoctions, medicated milk, buttermilk, water or coconut water is poured on the forehead in a continuous stream. This procedure helps induce a mental state similar to trance, creating profound relaxation of mind and body. It helps relax the central nervous system. Shirodhara is best in treating anxiety, depression, hypertension, diabetic neuropathy, insomnia, premature greying of hair, mental retardation, hair loss, paralysis and stress. This is a form of Shirodhara, involving pouring of medicated butter milk continually on the forehead in a rhythmic manner. This gives a cooling, moisturizing and relaxing effect. This is done for 7 to 21 days. It is highly beneficial in treating insomnia, fatigue, stress, IBS, psoriasis, greing of hair, hair fall, hypertension etc. 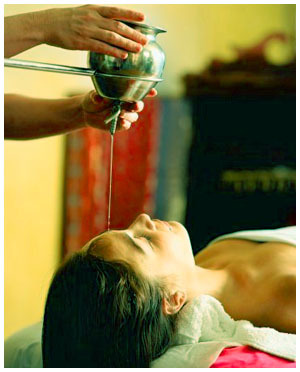 Medicated oil or milk is poured onto the body in continuous streams while also being gently massaged for an hour. Apart from being extremely soothing, this acts as a free radical scavenger in toning and strengthening and rejuvenating the whole body. It is done after Abhyanga. It increases ojas and body immunity, it is rejuvenating, is anti-aging, alleviates the burning sensation in the body, improves blood circulation, and helps recover quickly from fractures and paralysis. It is a rejuvenating treatment, wherein fresh plants are fried with various herbal ingredients and tied into boluses, dipped in warm, medicated oil, and is simultaneously massaged all over the body for an hour. This helps in treating chronic back pain, joint stiffness, muscular pain, sciatica, spondylitis, sprains and cramps. This rejuvenation technique is done with a special type of cooked rice, tied into boluses and dipped into a herbal decoction and warm milk. It is then skilfully massaged all over the body for an hour. It offers relief from paralytic strokes, strengthens tissues, relives body ache, osteoarthritis, rheumatoid arthritis, debility, emaciation and monoplegia. This is a specialized treatment that helps with weight reduction. In this procedure a herbal paste or powder is applied all over the body, and massaged well with specific movements for an hour. Apart from fighting obesity, it helps tone the skin and muscles, and expels kapha and other toxins from the body. There are other special treatments too that form a part of Kaya Kalpa chikitsa such as ‘Dhanyamla Dhara’, ‘Bahya Basti’, ‘Talapodichil’, ‘Netratarpana’, and ‘Sirolepana’. All of these therapies and techniques should be done only in specialized authorized centres, performed by experienced therapists. Discuss with your Ayurvedic physician about any concerns that you may have before going ahead with Kaya Kalpa Chikitsa, so that you can experience this ancient technique to the fullest and enjoy the wholeness of life that nature has bestowed upon you.